Arrived at McMenamin's Hostel at 4PM. This place is HUGE. The building has a long and interesting history. I was told that two brothers now own it. Story goes that one of them had stayed in hostels while traveling in Europe. 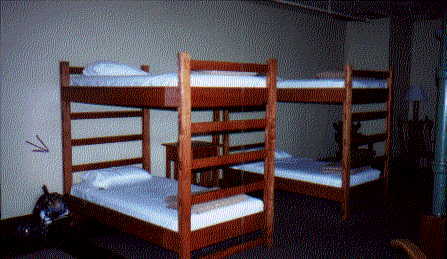 When he came back to the US, and he & his brother bought this place--he set aside two large rooms to be used as a hostel. I'm glad he did. It's a treat being here! Above: McMenamins Edgefield main lodge. What is now the main lodge was once the dormatory for the people working on the "Multnomah County Poor Farm" years ago. Later, it became the "Edgefield Manor for retired elderly". The main lodge not contains most of the Edgefield's bed & breakfast rooms, the Black Rabbit Restaurant, the Crystal Ballroom (on the second floor), and the hostel accomodations on the 3rd. floor. Everything in the main lodge is covered with artwork painted by 15 local artists. The painting are everywhere--the walls, elevator, ceiling, staircases, doors, pipes, fuse boxes, etc. I took a lot of pictures of them. They're really interesting! Check out their web site--you'll be able to see the paintings much better than the pictures I took. Their Self-Guided Tour Book calls the large collection of unique paintings "fantisical images". Most of them are huge, mural size paintings. Below: Yep, the room looks kind of spartan, but it was large, clean & quiet. The other side of the room had a table & chairs in front on the window over looking the backyard. And the rest of McMenamins Edgefield oozed character! Left: The Black Rabbit Restaurant is part of, and attached to McMenamins. It's a very classy restaurant. I splurged--again. McMenamins also has the "Power Station Theater". Built in the 1930's it originally supplied coal power to the property. It was converted to a 125 seat movie theater in the 1990's. 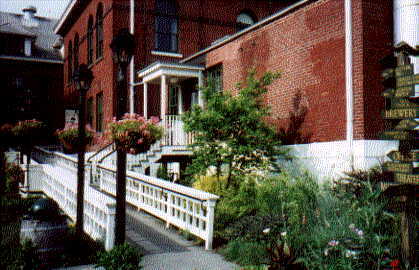 What is now the "Power Station Pub" was once utilized as a laundry by inmated of the jail. There are herb, flower, & vegetable gardens scattered throughout the property. This place has A LOT of stuff to see and do! ...It's raining this morning. It's the first rain that I've seen since I left Florida on April 13th...I hope it lets up a little because I want to get a good look a Mount St. Helens today. 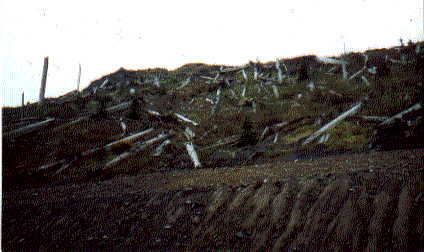 Above: Fallen trees on the side of Mount St. Helen's. ...Drove as far as possible up Mount St. Helens. Stopped at Cold Water Lake on the way. It was so quiet & still No one was there. 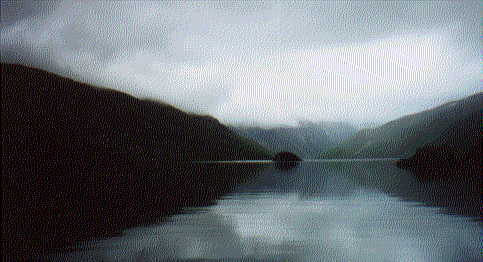 Cold Water Lake created by the volcano's eruption in 1980. The higher I drove up the mountain, the cloudier it got. It was so cloudy at the visitor center that you couldn't see 10 ft. in front of you. There were lots of tour busses up there filled with disappointed tourists. But it was well worth the drive up the mountain if only to see the still beauty of Cold Water Lake.